Patrick Roy will take over in Denver, what's next for him and the Avalanche? Home/NHL West/Colorado Avalanche/Patrick Roy will take over in Denver, what’s next for him and the Avalanche? Patrick Roy will take over in Denver, what’s next for him and the Avalanche? After a minor debacle with his younger brother’s Facebook spoiler, Patrick Roy will be returning to Denver, Colo. as the seventh head coach of the Colorado Avalanche. Not only did Roy get the call to coach but will also be second to Executive VP of Hockey Operations Joe Sakic as Roy will also be VP of Hockey Operations, sharing duties with Super Joe in player/personnel decisions. Roy will be welcomed back with open arms to Denver, having won two Stanley Cups and two Conn Smythe Trophies while playing with Colorado from 1995-2003. He was the biggest piece to bringing Denver its first professional sports title in 1996 after the Avalanche bested the Florida Panthers for the Cup in their inaugural season in Colorado. Since leaving the NHL, Roy has been coach and part owner of the Quebec Remparts of the Quebec Major Junior League where he has amassed a 307-128-32 record, including a Memorial Cup. There are those who are skeptical that the Avalanche will become a “good ‘ol boys club, trying to recreate the magic,” as Denver Post Adrian Dater said during a radio interview this past week. I can’t disagree with that assertion but I have more optimism than skepticism that Roy and Sakic can clean it all up together. They weren’t the warmest of teammates nor have they been the warmest of fellow Hall of Famers, but it appears that maybe they can set aside past differences and come together in a joint effort to restore their former team to glory, or at least an over .500 record. Many naysayers point to Wayne Gretzky’s tenure as part owner and head coach of the Phoenix Coyotes, exclaiming an example of a great HoF hockey player that couldn’t cut it as a coach. The Great One may very well have not been a great hockey coach, but we are talking about the Coyotes here. The ‘yotes haven’t exactly been a premier team and have been in a hockey purgatory since they left Winnipeg. Dismal attendance isn’t something the Avs have a problem with, plus they have a stable ownership and quality players unlike the Coyotes. 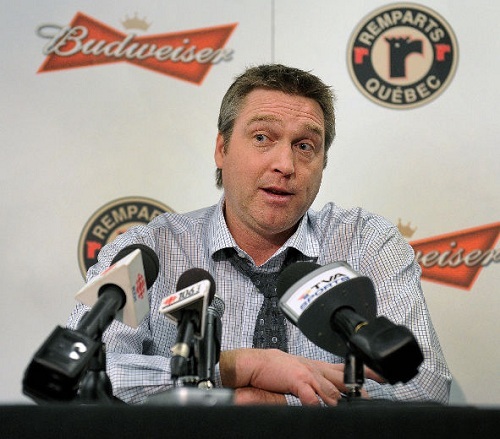 Patrick Roy will become the seventh head coach of the Colorado Avalanche. Roy isn’t taking over a team that has no players, bad attendance and unstable ownership. The Avs need to cut ties with the under-performing players and Sakic and Roy will be spearheading that effort. They also may need to find a new goalie and I believe that Semyon Varlamov may very likely be packing his boxes as we speak. No way does St. Patrick coach a team with a questionable goaltender, and I think one of his first orders of business will be finding the Avs a new netminder. JS Giguiere may still get to be backup but I doubt Roy chooses him as the starter over somebody else. This isn’t an overnight project, but having Roy in the mix lends some belief that the stars of yesteryear will have a bigger stake in seeing that their new job titles, rings, names and HoF credentials be put to good use in turning the Avalanche around and pointing them in the right direction. The Colorado Avalanche will host a press conference on Tuesday to make all things official.